This Software is designed to accommodate the needs of various types of properties viz the hotels, motels, resorts, clubs, B & B's, small hotel franchisees, clubs, condo's, hostel and apartments. HotelPlus is installed in more than 98 countries round the globe with a support centre in 40 countries. HotelPlus, Hotel Sotware is the modern solution which has whole range of integrated modules to cover every aspect of property management. 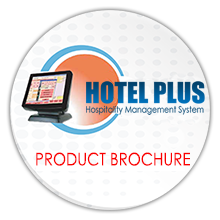 The generalized version of HotelPlus Hotel Management System software is wide accepted worldwide with due to its state-of-art technology and extremely easy to use in nature. The major modules of the latest HotelPlus constitutes of Restaurant Module, FrontOffice Module, Stores Module, BackOffice Module, Health Club Module, Reservations Module, Guest History and lot other.